I want to do a Thai salad tonight, the thing that I am not sure is, should I do a beef salad or a shrimp one? I guess I had enough meat for the last few days, maybe it’s better to go for shrimp. 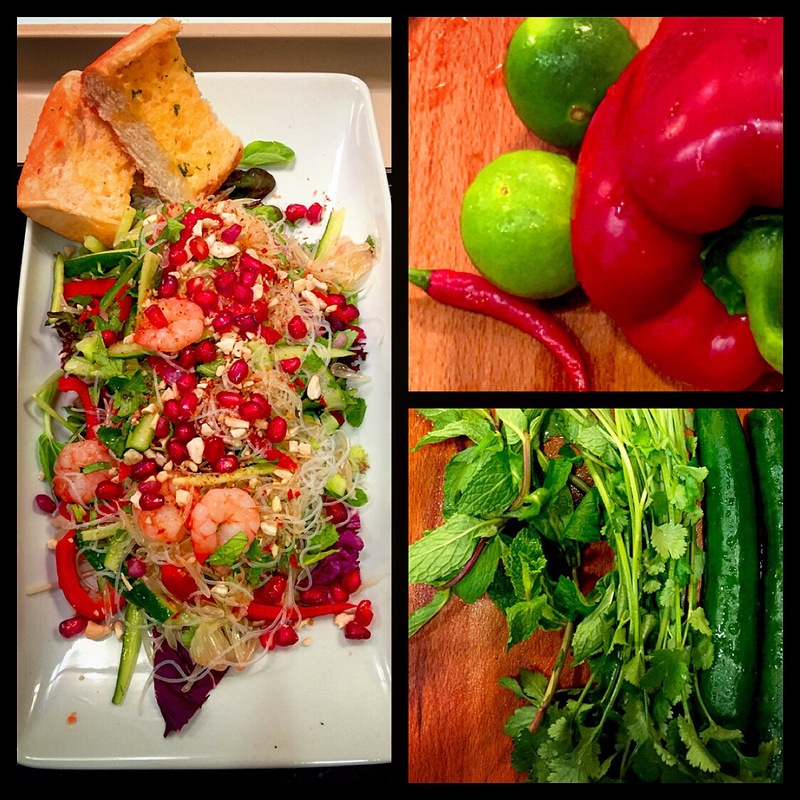 The ingredients of this salad are, shrimps, cucumber, red pepper, mint, coriander, mixed greens, red chili, shallots, pomelo, pomegranate, vermicelli, cashew nuts and shredded coconut. For the salad dressing, we need fish sauce, soy sauce, lime juice, brown sugar and minced red chili. The first thing to get ready is the shrimps, boil a pot of water, and cook the shrimp in the hot water until they turn into red meaning cooked. Put the shrimps aside until they cool down. Repeat the same thing for the vermicelli, cook them quickly in the hot water, not to overcook them, then put them aside until they cool down. On the other hand, we need to get two things done as well. Heat up the pan and then put the shredded coconut in the dry pan, fry them until they turn into brown colour. The next thing to get ready is to grind some cashew nuts with the mortar. Let’s start to get all the chopping done, cut the cucumber and red pepper into thin strips, chop the shallots, mint and coriander, then mixed them into a large bowl. Put the pomelo, shrimp and vermicelli into the bowl as well when they are both cool down, then mix everything together. You can either add the mixed greens here or lay them on the plate as a base when you serve the salad, it’s up to you. What I did is lay the mixed greens on the plate as a base, then put the mixed salad on top of the mixed greens, and now put the salad dressing on the salad. Sprinkle some shredded coconuts and cashew nuts on top of the salad, and do the final touch with the pomegranate. I also serve the salad with some garlic breads.